^ William M. Haynes (2013). CRC Handbook of Chemistry and Physics. CRC Press. p. 4-86. ISBN 9781466571150. ^ a b c d Shi, N; Fort, D (1985). “Preparation of samarium in the double hexagonal close packed form”. Journal of the Less Common Metals 113 (2): 21. doi:10.1016/0022-5088(85)90294-2. ^ Lock, J M (1957). “The Magnetic Susceptibilities of Lanthanum, Cerium, Praseodymium, Neodymium and Samarium, from 1.5 K to 300 K”. Proceedings of the Physical Society. Section B 70 (6): 566. Bibcode: 1957PPSB...70..566L. doi:10.1088/0370-1301/70/6/304. ^ Huray, P; Nave, S; Haire, R (1983). “Magnetism of the heavy 5f elements”. Journal of the Less Common Metals 93 (2): 293. doi:10.1016/0022-5088(83)90175-3. ^ Okazaki, T; Suenaga, Kazutomo; Hirahara, Kaori; Bandow, Shunji; Iijima, Sumio; Shinohara, Hisanori (2002). “Electronic and geometric structures of metallofullerene peapods”. Physica B 323: 97. Bibcode: 2002PhyB..323...97O. doi:10.1016/S0921-4526(02)00991-2. ^ Chen, X.; Roth, G. (1995). “Superconductivity at 8 K in samarium-doped C60”. Physical Review B 52 (21): 15534. Bibcode: 1995PhRvB..5215534C. doi:10.1103/PhysRevB.52.15534. ^ Wu, G. et al. (2008). “Superconductivity at 56 K in Samarium-doped SrFeAsF”. Journal of Physics: Condensed Matter 21 (14): 142203. arXiv:0811.0761. Bibcode: 2009JPCM...21n2203W. doi:10.1088/0953-8984/21/14/142203. ^ a b c d e f g h Emsley, John (2001). “Samarium”. Nature's Building Blocks: An A–Z Guide to the Elements. Oxford, England, UK: Oxford University Press. pp. 371–374. ISBN 0-19-850340-7. http://books.google.com/?id=j-Xu07p3cKwC&pg=PA371. ^ a b c d e f C. R. Hammond. “The Elements”. Handbook of Chemistry and Physics 81st edition. CRC press. ISBN 0-8493-0485-7. ^ 佐々木聡 (1997). “クリスタット 原子価揺動”. 日本結晶学会誌 (日本結晶学会) 39 (1): p. 147. ^ a b c d Audi, G; Bersillon, O.; Blachot, J.; Wapstra, A.H. (2003). “The NUBASE evaluation of nuclear and decay properties”. Nuclear Physics A 729: 3. Bibcode: 2003NuPhA.729....3A. doi:10.1016/j.nuclphysa.2003.11.001. http://www.nndc.bnl.gov/amdc/nubase/Nubase2003.pdf. ^ 田中剛 (1985). “Sm-Nd法による年代測定”. 地学雑誌 94 (7): pp. 113-114. ^ a b c Gouteron, J; Michel, D.; Lejus, A.M.; Zarembowitch, J. (1981). “Raman spectra of lanthanide sesquioxide single crystals: Correlation between A and B-type structures”. Journal of Solid State Chemistry 38 (3): 288. Bibcode: 1981JSSCh..38..288G. doi:10.1016/0022-4596(81)90058-X. ^ a b Taylor D. (1984). Br. Ceram. Trans. J. 83: 92–98. ^ a b Leger, J; Yacoubi, N; Loriers, J (1981). “Synthesis of rare earth monoxides”. Journal of Solid State Chemistry 36 (3): 261. Bibcode: 1981JSSCh..36..261L. doi:10.1016/0022-4596(81)90436-9. ^ Jayaraman, A.; Narayanamurti, V.; Bucher, E.; Maines, R. (1970). “Continuous and Discontinuous Semiconductor-Metal Transition in Samarium Monochalcogenides Under Pressure”. Physical Review Letters 25 (20): 1430. Bibcode: 1970PhRvL..25.1430J. doi:10.1103/PhysRevLett.25.1430. ^ a b Meyer, G; Schleid, T (1986). “The metallothermic reduction of several rare-earth trichlorides with lithium and sodium”. Journal of the Less Common Metals 116: 187. doi:10.1016/0022-5088(86)90228-6. ^ a b c d Greis, O (1978). “Über neue Verbindungen im system SmF2_SmF3”. Journal of Solid State Chemistry 24 (2): 227. Bibcode: 1978JSSCh..24..227G. doi:10.1016/0022-4596(78)90013-0. ^ Baernighausen, H.; Haschke, John M. (1978). “Compositions and crystal structures of the intermediate phases in the samarium-bromine system”. Inorganic Chemistry 17: 18. doi:10.1021/ic50179a005. ^ Beck, H. P. (1979). “Hochdruckmodifikationen der Diiodide von Sr, Sm und Eu. Eine neue PbCl2-Variante?”. Zeitschrift für anorganische und allgemeine Chemie 459: 81. doi:10.1002/zaac.19794590108. ^ Beck, H. P.; Gladrow, E. (1979). “Zur Hochdruckpolymorphie der Seltenerd-Trihalogenide”. Zeitschrift für anorganische und allgemeine Chemie 453: 79. doi:10.1002/zaac.19794530610. ^ a b Nickerson, J.; White, R.; Lee, K.; Bachmann, R.; Geballe, T.; Hull, G. (1971). “Physical Properties of SmB6”. Physical Review B 3 (6): 2030. Bibcode: 1971PhRvB...3.2030N. doi:10.1103/PhysRevB.3.2030. ^ a b Solovyev, G. I.; Spear, K. E. (1972). “Phase Behavior in the Sm-B System”. Journal of the American Ceramic Society 55 (9): 475. doi:10.1111/j.1151-2916.1972.tb11344.x. ^ a b Cannon, J; Cannon, D; Tracyhall, H (1977). “High pressure syntheses of SmB2 and GdB12”. Journal of the Less Common Metals 56: 83. doi:10.1016/0022-5088(77)90221-1. ^ Nyhus, P.; Cooper, S.; Fisk, Z.; Sarrao, J. (1995). “Light scattering from gap excitations and bound states in SmB6”. Physical Review B 52 (20): R14308. Bibcode: 1995PhRvB..5214308N. doi:10.1103/PhysRevB.52.R14308. ^ Sera, M.; Kobayashi, S.; Hiroi, M.; Kobayashi, N.; Kunii, S. (1996). “Thermal conductivity of RB6 (R=Ce, Pr, Nd, Sm, Gd) single crystals”. Physical Review B 54 (8): R5207. Bibcode: 1996PhRvB..54.5207S. doi:10.1103/PhysRevB.54.R5207. ^ Botimer, J.; Kim; Thomas; Grant; Fisk; Jing Xia (2012年). “Robust Surface Hall Effect and Nonlocal Transport in SmB6: Indication for an Ideal Topological Insulator”. arXiv:1211.6769 [cond-mat.str-el]. ^ Zhang, Xiaohang; Butch; Syers; Ziemak; Greene; Paglione (2012). “Hybridization, Correlation, and In-Gap States in the Kondo Insulator SmB6”. Physical Review X 3 (1). arXiv:1211.5532. doi:10.1103/PhysRevX.3.011011. ^ Wolgast; Cagliyan Kurdak; Kai Sun; Allen; Dae-Jeong Kim; Zachary Fisk (2012年). “Discovery of the First Topological Kondo Insulator: Samarium Hexaboride”. arXiv:1211.5104 [cond-mat.str-el]. ^ a b c Spedding, F. H.; Gschneidner, K.; Daane, A. H. (1958). “The Crystal Structures of Some of the Rare Earth Carbides”. Journal of the American Chemical Society 80 (17): 4499. doi:10.1021/ja01550a017. ^ a b Meng, J; Ren, Yufang (1991). “Studies on the electrical properties of rare earth monophosphides”. Journal of Solid State Chemistry 95 (2): 346. Bibcode: 1991JSSCh..95..346M. doi:10.1016/0022-4596(91)90115-X. ^ a b Beeken, R.; Schweitzer, J. (1981). “Intermediate valence in alloys of SmSe with SmAs”. Physical Review B 23 (8): 3620. Bibcode: 1981PhRvB..23.3620B. doi:10.1103/PhysRevB.23.3620. ^ Gladyshevskii, E. I.; Kripyakevich, P. I. (1965). “Monosilicides of rare earth metals and their crystal structures”. Journal of Structural Chemistry 5 (6): 789. doi:10.1007/BF00744231. ^ Smith, G. S.; Tharp, A. G.; Johnson, W. (1967). “Rare earth–germanium and –silicon compounds at 5:4 and 5:3 compositions”. Acta Crystallographica 22 (6): 940. doi:10.1107/S0365110X67001902. ^ Yarembash E.I., Tyurin E.G., Reshchikova A.A., Karabekov A., Klinaeva N.N. (1971). Inorg. Mater. 7: 661–665. ^ Evans, William J.; Hughes, Laura A.; Hanusa, Timothy P. (1986). “Synthesis and x-ray crystal structure of bis(pentamethylcyclopentadienyl) complexes of samarium and europium: (C5Me5)2Sm and (C5Me5)2Eu”. Organometallics 5 (7): 1285. doi:10.1021/om00138a001. ^ Vohra, Y; Akella, Jagannadham; Weir, Sam; Smith, Gordon S. (1991). “A new ultra-high pressure phase in samarium”. Physics Letters A 158: 89. Bibcode: 1991PhLA..158...89V. doi:10.1016/0375-9601(91)90346-A. ^ Daou, J; Vajda, P; Burger, J (1989). “Low temperature thermal expansion in SmH2+x”. Solid State Communications 71 (12): 1145. Bibcode: 1989SSCom..71.1145D. doi:10.1016/0038-1098(89)90728-X. ^ Dolukhanyan, S (1997). “Synthesis of novel compounds by hydrogen combustion”. Journal of Alloys and Compounds 253–254: 10. doi:10.1016/S0925-8388(96)03071-X. ^ Zavalii, L. V.; Kuz'ma, Yu. B.; Mikhalenko, S. I. (1990). “Sm2B5 boride and its structure”. Soviet Powder Metallurgy and Metal Ceramics 29 (6): 471. doi:10.1007/BF00795346. ^ Etourneau, J; Mercurio, J; Berrada, A; Hagenmuller, P; Georges, R; Bourezg, R; Gianduzzo, J (1979). “The magnetic and electrical properties of some rare earth tetraborides”. Journal of the Less Common Metals 67 (2): 531. doi:10.1016/0022-5088(79)90038-9. ^ Schwetz, K; Ettmayer, P; Kieffer, R; Lipp, A (1972). “Über die Hektoboridphasen der Lanthaniden und Aktiniden”. Journal of the Less Common Metals 26: 99. doi:10.1016/0022-5088(72)90012-4. ^ Bärnighausen, H. (1973). Rev. Chim. Miner. 10: 77–92. ^ Zachariasen, W. H. (1948). “Crystal chemical studies of the 5f-series of elements. I. New structure types”. Acta Crystallographica 1 (5): 265. doi:10.1107/S0365110X48000703. ^ Asprey, L. B.; Keenan, T. K.; Kruse, F. H. (1964). Inorganic Chemistry 3 (8): 1137. doi:10.1021/ic50018a015. ^ Brown, R; Clark, N.J. (1974). “Composition limits and vaporization behaviour of rare earth nitrides”. Journal of Inorganic and Nuclear Chemistry 36 (11): 2507. doi:10.1016/0022-1902(74)80462-8. ^ Delafontaine, Marc (1878). “Sur le décepium, métal nouveau de la samarskite”. Journal de pharmacie et de chimie 28: 540. http://gallica.bnf.fr/ark:/12148/bpt6k78100m.image.r=Decipium.f548.langEN. ^ Delafontaine, Marc (1878). “Sur le décepium, métal nouveau de la samarskite”. Comptes rendus hebdomadaires 87: 632. http://gallica.bnf.fr/ark:/12148/bpt6k3044x.image.r=Decipium.f694.langEN. ^ De Laeter, J. R.; Böhlke, J. K.; De Bièvre, P.; Hidaka, H.; Peiser, H. S.; Rosman, K. J. R.; Taylor, P. D. P. (2003). “Atomic weights of the elements. Review 2000 (IUPAC Technical Report)”. 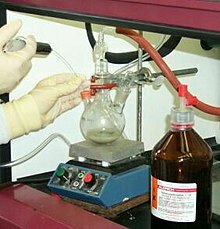 Pure and Applied Chemistry (IUPAC) 75 (6): 683–800. doi:10.1351/pac200375060683. ^ Delafontaine, Marc (1881). “Sur le décipium et le samarium”. Comptes rendus hebdomadaires 93: 63. http://gallica.bnf.fr/ark:/12148/bpt6k3049g.image.r=Decipium.f63.langEN. ^ a b c Samarium: History & Etymology. Elements.vanderkrogt.net. Retrieved on 2013-03-21. ^ Coplen, T. B.; Peiser, H. S. (1998). “History of the recommended atomic-weight values from 1882 to 1997: A comparison of differences from current values to the estimated uncertainties of earlier values (Technical Report)”. Pure and Applied Chemistry 70: 237. doi:10.1351/pac199870010237. ^ What are their prices?, Lynas corp.
^ Hajra, S.; Maji, B. and Bar, S. (2007). “Samarium Triflate-Catalyzed Halogen-Promoted Friedel-Crafts Alkylation with Alkenes”. Org. Lett. 9 (15): 2783–2786. doi:10.1021/ol070813t. ^ Cotton (2007). Advanced inorganic chemistry, 6th ed. Wiley-India. p. 1128. ISBN 81-265-1338-1. http://books.google.com/?id=U3MWRONWAmMC&pg=PA1128. ^ Pattison, JE (1999). “Finger doses received during 153Sm injections”. Health physics 77 (5): 530–5. doi:10.1097/00004032-199911000-00006. PMID 10524506. ^ Finlay, IG; Mason, MD; Shelley, M (2005). “Radioisotopes for the palliation of metastatic bone cancer: a systematic review”. The lancet oncology 6 (6): 392–400. doi:10.1016/S1470-2045(05)70206-0. PMID 15925817. ^ DOE Fundamentals Handbook: Nuclear Physics and Reactor Theory. U.S. Department of Energy. (January 1993). pp. 34, 67. http://web.archive.org/web/20090322040810/http://www.hss.energy.gov/nuclearsafety/ns/techstds/standard/hdbk1019/h1019v2.pdf. ^ Sorokin, P. P. (1979). “Contributions of IBM to Laser Science—1960 to the Present”. IBM Journal of Research and Development 23 (5): 476. doi:10.1147/rd.235.0476. ^ Zhang, J. (1997). “A Saturated X-ray Laser Beam at 7 Nanometers”. Science 276 (5315): 1097. doi:10.1126/science.276.5315.1097. ^ SmS Tenzo. Tenzo-sms.ru. Retrieved on 2013-03-21.